Oral-B is a name that has earned a reputation over the years when it comes to dental and oral health. The latest and innovative products continue to surpass the performance of the existing products and take oral care to whole new levels. The same can easily be said for Oral-B Vitality Floss Action Rechargeable Power Toothbrush. Once you have brushed your teeth with the Oral-B Vitality Toothbrush you will feel that you have had a professional cleaning. One of the most amazing features of the toothbrush is the timer feature. Yes the tooth brush has a two minute timer. Admit the fact that even the most meticulous of oral hygienists may not brush for a whole two minutes or not care to note the time. Oral-B Vitality toothbrush will make sure that you brush your teeth for full two minutes. Now let us move on to the other great features of the Oral-B Vitality Floss Action Rechargeable Power Toothbrush. For one thing it has a very reasonable price as compared to the benefits it has. The toothbrush has Micro-pulse Bristles that ensure a thorough cleaning. Even the remote areas and inaccessible spaces between the teeth are easily cleaned with the Micro-Pulse bristles. These bristles reach even the remotest gaps between the teeth through the oscillating and rotating action of the toothbrush. The superb cleaning action of the brush is also attributed to the FlossAction Head. The head is a little larger than the normal toothbrush heads but is perfect at its job, i.e. an immaculate cleaning. The FlossAction makes it easy to clean the areas near the gums and cleans the gum line thoroughly. Not only the toothbrush ensures clean teeth but healthy gums also. According to best electric toothbrush reviews, different heads can be used with the Oral-B Vitality Toothbrush. You can attach the Oral-B Dual Clean Electric Head that has two very different moving sections that ensure the cleaning of hard-to-reach areas. Or you can attach the Oral-B Pro White Electric Toothbrush Head that is specifically designed with a polishing cup that holds toothpaste over teeth for gentle cleaning and removes stains. With the oral-B Vitality Toothbrush you will always know when to replace the toothbrush head. The bristles keep fading with use and when the color is half gone you know it is time to replace the toothbrush head. The Toothbrush also has a very nonslip ergonomic handle that users find extremely convenient. The brush comes with a rechargeable battery and a charging station. You need to recharge the battery once a week on the average. The toothbrush head oscillates 7600 times per minute and the indicator bristles let you know when to change your toothbrush head. 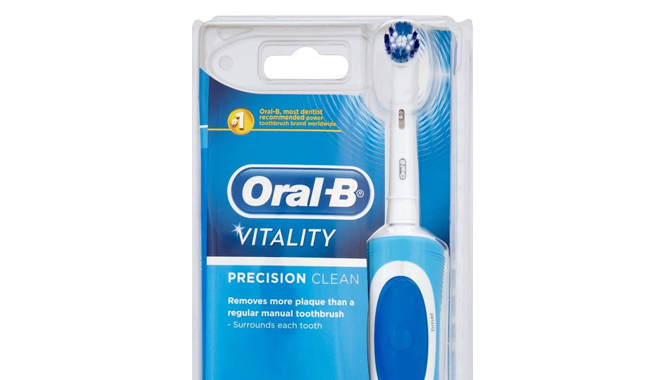 The Oral-B Vitality comes with an Oral-B Floss Action Brush Head but you can use other Oral-B brush heads also. The only minor problem with the toothbrush is that it has no charging light so it is really hard to tell when the unit is fully charged. Other than that the Oral-B Vitality Toothbrush is a perfect toothbrush that has a very reasonable cost and you can think you are getting a professional cleaning every time you use it.